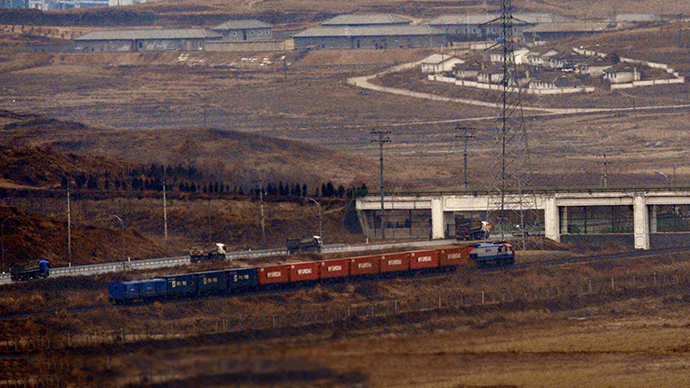 Russia opened a cross-border freight railway with North Korea as part of the Trans-Asian Railway project aimed at accelerating trade by connecting Asia and Europe, in the event the two conflicting Koreas unite to form a train network on the peninsula. “Our common objective is for this link and port to be a pilot scheme for the restoration of a single transport system in North and South Korea that would link the peninsula to countries that gravitate to this region, to Europe via Russia,” head of state-run Russian Railways, Vladimir Yakunin, said at the opening ceremony. The 54 kilometer route linking the North Korean port city of Rajin with the Russian border town of Khasan was inaugurated by top executives of both countries’ state train operators. Yakunun said the railway project should aide the improvement of the political tension between the rival Koreas, which have not technically achieved a peace agreement following the 1950-53 war that divided the countries. “We always work for peace, and we hope that this project will not only promote peace on the Korean Peninsula, but help friendly and peaceful relations between our countries,” he said. The freight railway will transport coal and import goods from South Korea and Asian states, said Yakunin, adding that the terminal at Rajin is expected to handle four million tons of coal a year, including shipments for OAO Mechel - one of Russia’s leading mining and metallurgical companies. The project was implemented in accordance with arrangements made by Russian President Vladimir Putin and North Korean leader Kim Jong Il in 2000. The reconstruction of the section started in 2009. A total of 18 bridges and three tunnels measuring over 4.5 kilometers have been constructed or rebuilt. It aims to connect Russia’s Trans-Siberian Railway to South Korea via the North, creating an integrated freight railway network and cutting transportation costs to Europe. Cargo shipment from Asia to Europe is expected to take 14 days – significantly shorter than sea freight shipping which takes 45 days.